One of the hardest trek to visit and investigate the untouched excellence of nature. An uncommon enterprise in the midst of transcending mountains. Climbing out of Gangotri through superb pine timberlands, the trail enters high elevation pastures. Kedartal is a combination of two words Kedar and Tal. Kedar means Shiva and Tal means Lake. Thats why it is also known as Shiva Lake. 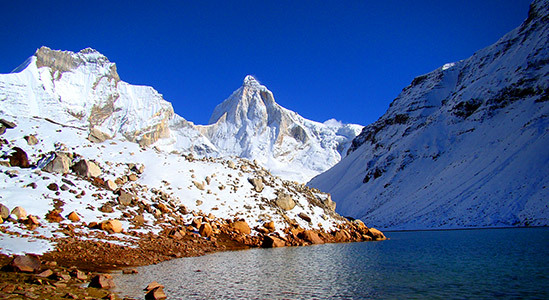 The tal is located in the altitude of 15,748 feet. 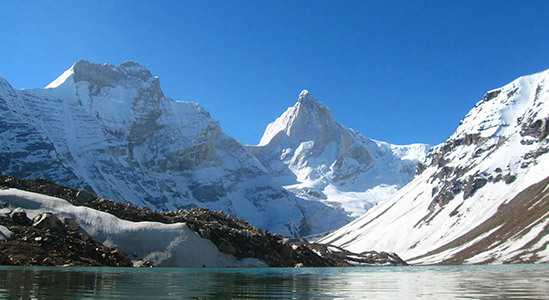 It is one of the most beautiful trek in Uttarakhand. It is surrounded by lofty peaks namely Thalaisagar, Meru, Bhrigupanth and Jagin and melting snow from these peaks sustain like lakes that makes it one of the best trek in India. The trek is starting from the Gangotri (9,576) to Kedartal (15,748). Once you will reach at the top you will see the majestic himalayas ,mountain altitude exceeding and the shimmering emerald glacial lake. It is moderate to difficult level. Physically fit have a high endurance level and experienced trekker capable of doing this trek. You need to ready for long distance and challenging territory each day.For the beginners they have to be physically and mentally fit for this trek. Kedartal trek is last for 7 days including the Pickups and return. Pickup from the Dehradun the trekker are taken back to Gangotri where they driven back to Dehradun. The average of 6 hours per day the trekker has to do a trekking. May-mid June and September and October are the best month to go for this trek.The weather gets extremely cold during the remaining months. during October and June much of the snow is away. In kedartal trek temperature is varies with time. In the day time temperature is 12oC to 17oC. In the night time temperature drop to -2oC to -3oC. The trek in itself is incredible. Moving out of Gangotri through glorious pine woodlands, the trail enters high elevation pastures. The camps en route give fantastic perspectives of the colossal mountains encompassing these settings. This is one of our few treks where you quite often locate the blue sheep or bharals. The assortment on the trek, fabulous perspectives and staggering mountain settings make this one of the immense treks in India. You will head to Gangotri from Dehradun. Gangotri is the origin of the river Ganga and the seat of goddess Ganga is one of the four sites in the chota char dham pilgrimage circuit. You will stay night in Gangotri. You can see temples,ascetics caves, local market,Pine forest and evening aarti of the River. You left gangotri in the morning which is the starting point to kedartal trek. You crossed the bridge over the bhagirathi river. You will also passed the asharms of a few sages. Initially you started your trek through the majestic deodar forests. After an hour of continuous climbing you passed through the fir and bhoj (birch) redes. Most of our ancient indian text were written on these fir and bhoj due to its durability and texture. The trek to bhoj kharak is challeging.To keep you hydrayed and fit you should take a small sip of water at equal amount of time. The trail crosses three water points from where you can refill your water bottle. After four hour of trekking you came across a narrow spaced stone wall covered with snow which is popularily known as Spider wall. Keep one thing in mind never look down just focus on the next step you will crossed path confortably . When you reach at Bhojkharak you will have to find out a flat stretches to pitch your tents. The trek to kedar kharak situated at 14,468 feet and it takes 7 km around 5 hours. The trek from Bhoj kharak to Kedar kharak is simple as compared to the previous day ascending. After 1 km of initial ascending through the bhoj trail you could see meadows from there onwards the trek is devoid of any trek. You will see the majestic snow covered with Bhrigupanth peak. The climate gets colder as you reach the high altitude and notice a thin layer of frost over the stones in the streams. After cross a two water points you will reach Kedarkharak. The sunset at Kedarkharak is the exceptional sight to watch. At the height of the 15,748 feet the tal is 5 km slag from kedar kharak through rocky mountain and there is no greenery around. On this day excitement level of the trekker is extremely on peak. Take sufficient bottles of water in the bag to ward off the dehydration. A lot of loose rocks on the way make sure that you watch your step. After a 5-6 hours of ascending you can see the Thalaysagar peak across a rocky bridge. In Thalaysagar you could also feel the effect of high altitude over your body . Once you crossed the bridge the descent to the lake begins it was mostly frozen. Make sure you wake up early in the morning to watch the first ray of the sun to catch the surrounding mountain. Then start the descent to kedarkharak after the breakfast. It was comparatively east as it was a descending journey and be carefull of a loose rocks. Start the descent to Gangotri after the breakfast. The trail back to the Gangotri is all together downhill critical step is finished. This also enables you to cherish last time surrounding. After breakfast, You head back to Dehradun from Gangotri by vehicle. Trekking on Kedartal, no doubt, is one of the most thrilling adventure one could ever have in his/her life. With an elegance of nature and unmatchable experience of the pristine mountain ranges, trekking stands out among all the adventures across the world, but nothing comes free, there are certain aspects of the trekking which one needs to consider while he/she is making up his/her mind for trekking. Here’s a list of some basic requirements which one would need during his/her camp trekking. Let’s pay some heed to these requirements for trekking. Three warm layers: On high altitude treks Kedartal, temperature after the sunset drops to the considerable degrees. So, during these campsites, you might need an additional layer along with the padded jacket coupled up with a fleece and a warmer. Sun cap: The sun feels brighter and nearer at high altitude treks like Kedartal. Used sun caps to save your neck and face from sun Burns, Especially if you are trekking at the end of the day. Trekking on Kedartal is a different kind of adventure where you required to be physically and mentally prepared for the best and worse, at the same time. While high altitudes treks making it tough to breathe, the beauty of those pristine mountains leaves you speechless so that you forget to breathe for a moment or two. In addition to the physical and mental preparation, there is a certain aspect of the health that is needed to be considered on the first hand when you make up your mind about the trekking at Kedartal. Trekking at Kedartal demands endurance and fitness and those who suffer any kind of physical or physiological ailments are advised not to go for high altitude treks in the beginning. To get assurance about the trekker’s fitness, we comply with certain aspects of the being fit such as BMI (Body Mass Index) along with the fitness proof since we can’t put the trekkers into the risk. Monitoring the health is one thing that is conducted regularly during the Kedartal trek by the trek leaders which includes the monitoring of your blood pressure, oxygen level and pulse rate. Details of your health during the trek is maintained in the health card on the regular basis. Health card can be collected from the trek leader at the end of the trek. 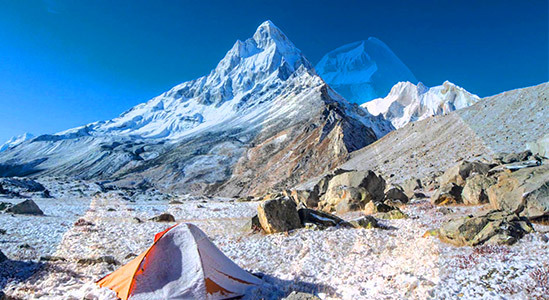 Trekveda provides you all the necessary equipment for trekking at Kedartal from tents to ropes. In addition to that, our trek leaders also ensure the safety by various safeguards they take from time to time for your safety. Microspikes are provided to attach to your shoes which help you to keep the traction on the snow and make it easier to climb. An additional gaiter is provided to cover the snows which prevent the entering of snow into the shoes. Customized tents are provided to the trekkers which ensure the warmth and temperature 10 degrees higher than the outside coupled up with high-quality sleeping bags which can endure the temperature up to 15 degree Celsius below the freezing point. 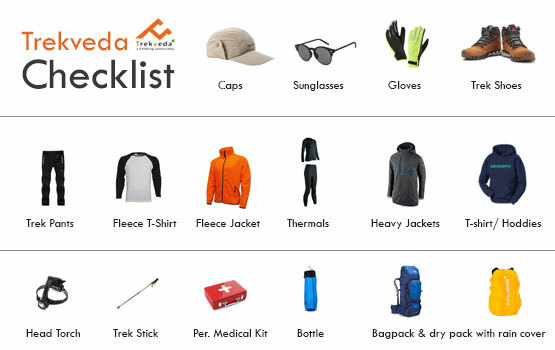 Trekveda, keep all your nutritional and hydration requirements on its checklist, our trek leaders will guide you to keep your body hydrated on the high altitudes Kedartal trek as de-hydration can attract to the severe medical emergencies while trekking. Problems like Acute Mountain Sickness can prove fatal at Kedartal if not taken into consideration seriously on time. If you face any of the symptoms such as a persistent headache, fatigue or weakness, nausea, dizziness, loss of appetite, difficulty in sleeping, you shouldn’t let it go or treat it by your own either just inform your trek leader. Kedartal is moderate type trek which is suitable for beginners if they have at least 2 months physical and mental conditioning. However, even being a moderate type trek, proper study of the trek must be made. Trekking at Kedartal, for its ever-lasting memories and experience, demands just a few things which involve physical endurance with physiological wellness. Not just the one who’s physically fit would do the magic in trekking but one also needs to be mentally fit as well in order to cope up with the adversities one might have to face during the treks such natural calamities, rains or other unforeseen conditions. Getting to the Kedartal trek without proper preparation is something you should never do. Cardiovascular exercise is one of the most sought-after methods which provides not just the physical endurance but also the strength to withstand any unavoidable circumstances sternly. Trekking at Kedartal demands the high endurance which you can develop in a month or two where you need to begin with the jogging or running (only if you could do). This practice needs to be combined with the speed and distance targets. You need to keep on increasing both with the time. Another vital area of improvement, you need to work upon. Before you head to the Kedartal trek, you need to have the physical strength in order to carry backpacks on the uneven terrains. Considering everything under the sun, you ought to prepare yourself for the core strength. A strength would be making you suffer less than others who don’t prepare before it. To pacify yourself or any other companion, yoga and meditation are the keys. These practices not only give you the mental peace but also provide you with a placid inner conscience which is extremely important in order to withstand the cons during the Kedartal trek. The trek expense of Rs. 12,499 + 5% GST takes care of all expenses of the trek from Gangotri to Uttarkashi. Backpack offloading charges - If you wish to offload your backpack, there will be an additional charge of Rs. 1650 + 5% GST. The backpack cannot weigh more than 9 kgs. Suitcases/strollers/duffel bags will not be allowed. Please note that charges will vary for last minute offloading in case you decide to offload your bag after reaching the basecamp (Rs.400 per day inclusive of tax). Online offloading in advance is possible up to two days prior to the trek start date. Buffer day – It is mandatory to have this extra day as any bad weather or rain will delay your pass crossing. If buffer day is utilized, you will need to pay Rs. 2,200 + 5% GST. This amount is to be handed over to your trek leader. What is the average Kedartal temperature is? 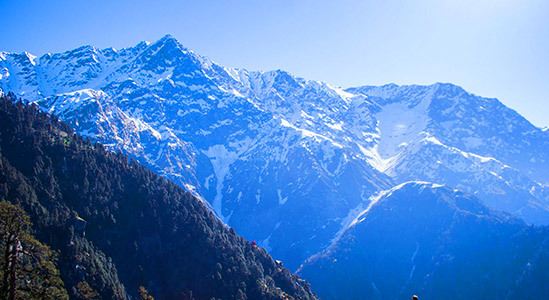 The temperature of Kedarkantha trek in winter remains –2°C to –9°C. What is the height of Kedartal Trek? The Kedartal height varies with every phase you pass as your approach the Kedartal trek, you will acclaim a height of around 16,116 ft.
What will be the base camp of Kedartal trek? Trekveda makes it's basecamp at Gangotri. This is one of the most beautiful places that leads to you to the pristine areas while letting your relish the vibrancy of nature. How do we reach Gangotri? Our basecamp would be at Gangotri. Post your arrival at Dehradun/Haridwar/Rishikesh and you will be travel in a cab from here to Gangotri with fellow Trekkers, planning a trip as per the comfort would make your trek easier and you’d not be exhausted before the real thrill. Your accommodation at Gangotri in the beginning and the end at the guest houses where you’d be sharing the rooms with the fellow Trekkers. Food and stay cost is include in your trekking package in Guest house. The stay on the other days will be in the tents which will be provided by the Trekveda. Each tent will be shared by three fellow trekkers however special arrangements can be made on request. A separate tent will be assigned as the toilet room at each campsite. Any additional baggage (without valuables) can be left behind at the Gangotri. No, you can not take your child on Kedartal trek, the minimum age limit for Kedartal trek is above 18. The best season to see the snow on Kedartal trek is September and October where you can see a lot of snow-clad you can also witness the fresh snowfall at heights if the climate is favorable. Mobile network on this trek will be until Basecamp which is Gangotri. After that, there is no network coverage. The distance of each day would vary as per the campsite location, however, there’s a rough figure of 10-12 Km you need to cover each day during the trek. Kedartal trek is considered as Moderate to difficult trek. Your basecamp Gangotri will be your starting point and ending point will be Uttarkashi. You will get this details while booking of trek respectively. The sloppy ice treks on Kedartal trek make it difficult to walk. You can’t risk taking the preparation for physical strength prior to trek for granted as it may cost you losing your best trek experience. However certain implications are considered by our professionals before accepting the trekkers of age above 45 such as their physical strength and stamina coupled up with any medical condition that may become fatal during the course of trek. But you can get trekking Shoes and other equipment on rent directly from the marking in Gangotri. Returning to the home with the mystical memories would probably be the best feeling after the trek. Your Trek will end at Uttarkashi, to return you will take a cab from Uttarkashi to Dehradun. What will be the total expense for a Kedartal trek? The total expenses of the trek will be INR 12,499 per person. In addition to that an additional of 5% of the GST will be levied on the total cost. You will be staying in a geust house at Barsu. Accommodation on all other days will be in tents (2-3 per tent).